GAROWE, Somalia Jan 20, 2015 (Garowe Online)-Leaked Puntland Government blacklist reveals blocking order that would have taken Garowe Online off air amid concerns over the freedom of information and rife media censorship in the northeastern state, Garowe Online reports. A letter dated September 20, 2014 but leaked to the outlet on Tuesday asks the largest telecom operator in Puntland, Golis to block Garowe Online, Galgalanews, Xaysimo, Puntlandtoday, Puntlandnow and Jidblaale from inside the regional state. The six sites with Garowe Online listed first were blamed for defaming high-ranking government officials, public incitement and turning local tribes against each other. Media Association of Puntland (MAP) has reacted at the web censorship, urging the government to lift ban on the five other websites that have been remaining banned since October when the decree came into effect. 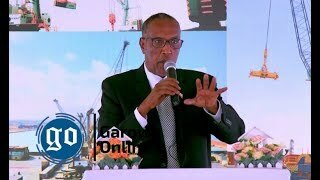 “We call upon Golis Telecommunications Company to lift ban on the websites unconditionally, the block of these sites is another black mark on freedom of press in Puntland, and it’s an attempt to silence freedom of press,” MAP Secretary-General Fatima Mohamed Mohamud said in a press statement from the fraternity. 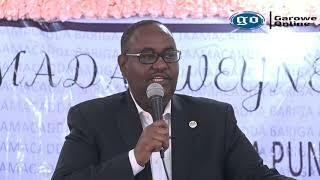 Al though the blocking order failed to affect Garowe Online, the sister publication of Radio Garowe that broadcasts daily on FM stations in Puntland capital of Garowe, Eyl Coastal Town and Bossaso Port City, the management and the board of directors vehemently condemned the blocking order. “Garowe Online Editors and Staff Writers who celebrated 10th anniversary in February 2014 refute the false allegations mentioned in the presidential decree,” said the founder.” We are known for balanced coverage by Peace-loving Somalis and International Community”. 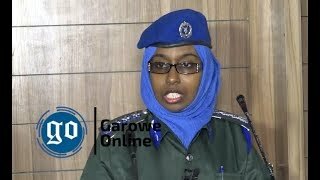 Garowe Online board members indicated that the order doesn’t comply with the constitution and runs counter to the right to freedom of expression. No judicial writ was attached to the decree, with Garowe Online board members saying they are deeply concerned with the unilateral moves and call on officials at the ministry of information to let blocked sites resume operation. 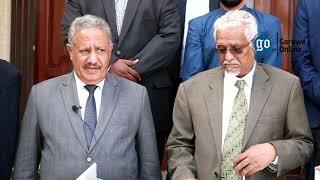 On December 11, Reporters Without Borders unveiled it is worried about freedom of information in the autonomous northeastern region of Puntland. 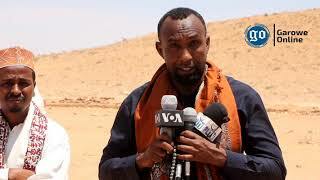 The concern by press watchdog came after Nugal regional police commander Ahmed Abdullahi Samatar threatened Radio Garowe journalist Ali Abdi Du’alle with arrest. Of 180 countries, Somalia was ranked 176th in the 2014 Reporters Without Borders press freedom index.